Start in Cape Town, which we consider to be the most picturesque city in all of Africa, due to its fusion of astonishing physical beauty and an eclectic 21st-century urban lifestyle. Cape Town’s iconic Table Mountain serves a dramatic backdrop for this ethnically diverse city. An impromptu Zulu dance, the cobble-stoned streets of the Muslim Bo Kaap community, and Dutch architecture are just some cultural immersions that await you. After a taste of both urban and natural landscapes, you will journey the UNESCO World Heritage Site, the Okavango Delta in Botswana. With a meticulously constructed conservation program, the Okavango Delta is perhaps the best region in Africa to see the likes of African bush elephants, black and white Rhinos, the spotted hyenas, and the African wild dog to name a few! Cap your visit in Namibia, an excellent juxtaposition to Botswana, having the oldest desert on the planet. Such an expansive landscape, Namibia is a kaleidoscope of environments from the white saltpans of Etosha, red dunes of Sossuvlei, and isolated beaches of the Skeleton Coast. Upon arrival in Cape Town, you will be privately transferred to Cap Grace Hotel. Your day begins with a 25-minute ride from the Victoria Alfred Waterfront to the world UNESCO site of Robben Island, which served as a prison for 450 years. You then tour the Atlantic seaboard along Camp’s Bay to Table Mountain. A cable to the summit of Table Mountain leads you to a spectacular view of Cape Town. After breakfast at Cape Grace, you will be picked up by your local guide and driver for a full day tour of Cape Point, located on the south-western tip of the African continent. Notwithstanding our many world travels, we feel Cape Point offers some of the most spectacular ocean/mountain scenery in the world. Traveling through the Cape of Good Hope Reserve you may see zebras, elands, bontenoks, and jackass penguins. As you travel back to Cape Town via Simon’s Town, you may opt to stop at the National Botanic Garden, recently voted one of the top ten gardens in the world (by curators of Kew Gardens in London!). With its deep, rich Dutch legacy and strong French influence, the Franschhoek Valley is widely regarded as one of the world’s foremost areas for food and wine. We agree! The Western Cape is blessed with a climate, which enables world-class wines to be made here in the midst of scenery and historic estates, which even jaded eyes agree are breathtakingly beautiful. 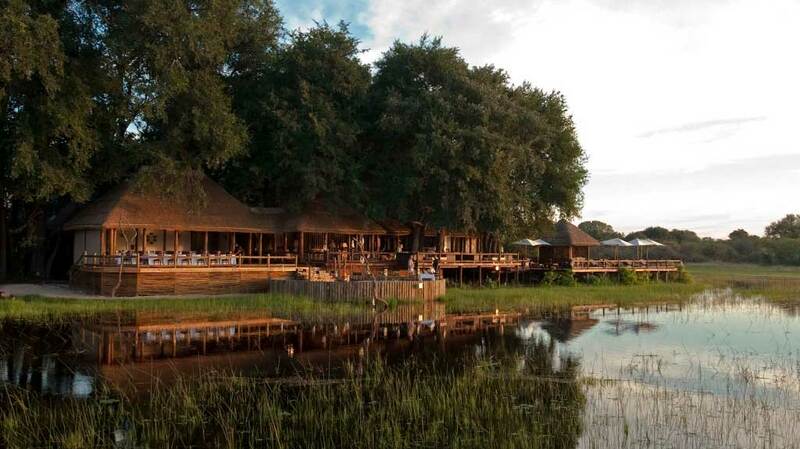 Upon arrival, you will be privately transferred to Chief’s Camp in the animal rich Okavango Delta. Expert guides will share their extensive wildlife knowledge while providing you with the awe-inspiring opportunity to view roaming lions, antelope, zebras, buffalo, and wild dogs. You will even get to enjoy a scenic helicopter ride over the Moremi Game Reserve. Welcome to Namibia! You will have a forced overnight Hotel Hoanib before your much-anticipated stay at Hoanib Camp. Known as the “The Land God Made in Anger” by the Khosian bushman, Skeleton Coast is a ghostly environment harboring the skeletal remains of whales, shipwrecks, and footprints of elusive animals. You will have numerous opportunities to embark on game drives, nature walks, skeleton coast excursion, and even interact with wildlife researchers. You also may take a day trip to a desert oasis, where desert animals collect. This 120-room luxury property has been our favorite hotel in Cape Town for quite some time, with much positive client feed-back. Cape Grace is located on a private yacht basin on the city’s Victoria/Alfred water front. The rooms here are particularly large, with each room decorated with Cape Dutch antiques and man-made fabrics. We particularly enjoyed the library with its warm, open fireplace. Nice 45 foot outdoor pool and a very lovely spa (with panoramic views!). This 120-room luxury property has been our favorite hotel in Cape Town for quite some time, with much positive client feedback. Cape Grace is located on a private yacht basin on the city’s Victoria/Alfred waterfront. The rooms here are particularly large, with each room decorated with Cape Dutch antiques and man-made fabrics. We particularly enjoyed the library with its warm, open fireplace. Nice 45 foot outdoor pool and a very lovely spa (with panoramic views!). A short walk to the center of lovely Franschhoek with its many restaurants and shops, the luxury 21-room Le Quartier Francais is our most frequently requested 5-Star properties in the Cape Wineland area. All the rooms here are spacious and feature wood-burning fireplaces and baths (with heated floors! ), as well as all the usual amenities of a luxury manor. We particularly like the rooms’ airy, open windows and the hotel’s understated sense of luxury and personal service. A nice pool and beautiful, lush grounds add to the “oasis” feeling at Le Quartier. Chief’s camp is yet another example of the many luxury safari camps to choose from in the predator-rich Okavango Delta. Set in the Moremi Game Reserve, Chief’s Camp is made up of 10 1,500 sq. ft. luxury bush pavilions and one suite, all with private decks with plunge pools, as well as indoor and outdoor showers. We particularly like the pavilion’s polished teakwood floors, insect-proof netted windows and colorful batik fabrics. Other amenities include a new spa treatment room, a small pool, and picturesque dining area/observation deck. Based on the Chief’s location overlooking a large lagoon on the northwest tip of Chief’s Island, many mokoro (canoe/boat) game excursions are a continuing fun activity in the summer (! )The game-viewing here includes all of the “Big 5” (African lions, elephants, Cape buffalo, and rhino) hence, our choice as a prime family safari site. Chief’s renovation includes 10 luxury bush pavilions (in effect like small cottages), all with private terrace plunge pools, 462 sq. ft. Similar to Chief’s and Vumbura Camps in Botswana during the year-end and summer seasons, availability at the luxury 7-suite Hoanib Camp on the Skeleton Coast of Namibia is limited and must be requested at least one year in advance. Set in a private concession area, the stark desert landscape here us an otherworldly contrast from the Okavango Delta of Botswana. It is truly a wonderful experience to see elephants, lions, giraffe, and hyena roaming the dunes of this arid environment. Another big plus is its 4-hour drive distance from Namibia’s shoreline, dotted with Cape fur seal colonies! Based on the area’s limited rainfall, Hoanib Camp is a year-round destination, although the local guides feel March to May offers the most idyllic conditions for lush, game-viewing. With no WiFi here, this is a place where you’re temporarily off the grid!